But it doesn’t have to be. Imagine a world of color in your pocket. The ability to find the perfect color combo for any project. That’s what I’ve created for you with The Color Catalog. The Color Catalog is unlike anything you’ve ever seen. It’s a fully interactive guide that has been crafted to extend your creativity and help you find the perfect color in any situation. You’ll never be stuck for colors again. After hearing everything we can do, I was hooked to have this book. This helps me choose colors efficiently, test them, and find combinations that works the best. I absolutely LOVE how easy it is to navigate on the PDF version. I also love that I have the option to print individual palette pages. Eventually I’d like to print up everything and put it all in a binder. This color catelog is absolutely beautiful and so well done!! You’ll want to add this to your collection for sure!! I love colouring and using my Copics, but I have found just lately that it was getting harder and harder to choose workable colours for the project I wanted to do. That was until I came across Sarah new Colour Catalogue. I am so pleased that I purchased this as I now not only have a printed out catalogue but I also have a interactive (on all platforms) digital version available with me wherever I go. Within a few seconds I can have numorus options to choose from either via word association, colour or type and once I have a colour scheme I like I can just print it out and choose the best matches to go with my project. This is a real must for anyone who’s a crafter or artist. 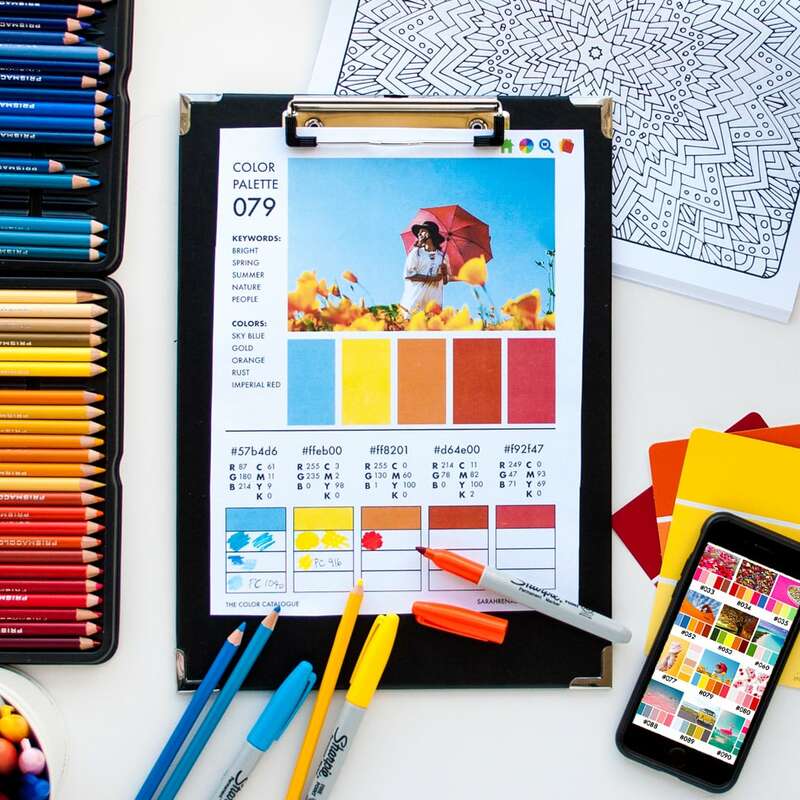 As no matter what mediums you like to use, this system make the most time consuming part of any project less stressful as you can simply just choose a colour palette grab the matching pens/medium and get on with the fun part of colouring. This catalog is amazing! 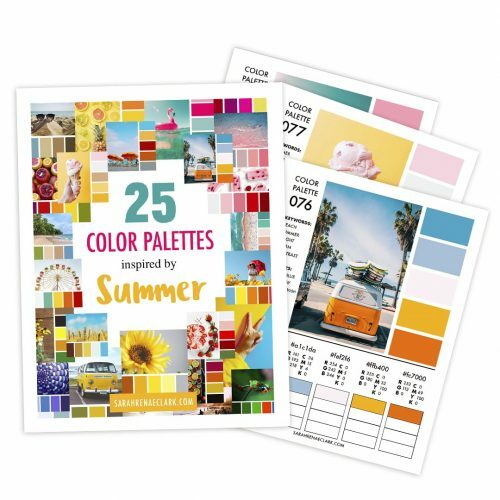 First of all, can you believe it contains 250 color palettes? And if you think it’s only that, it’s not. 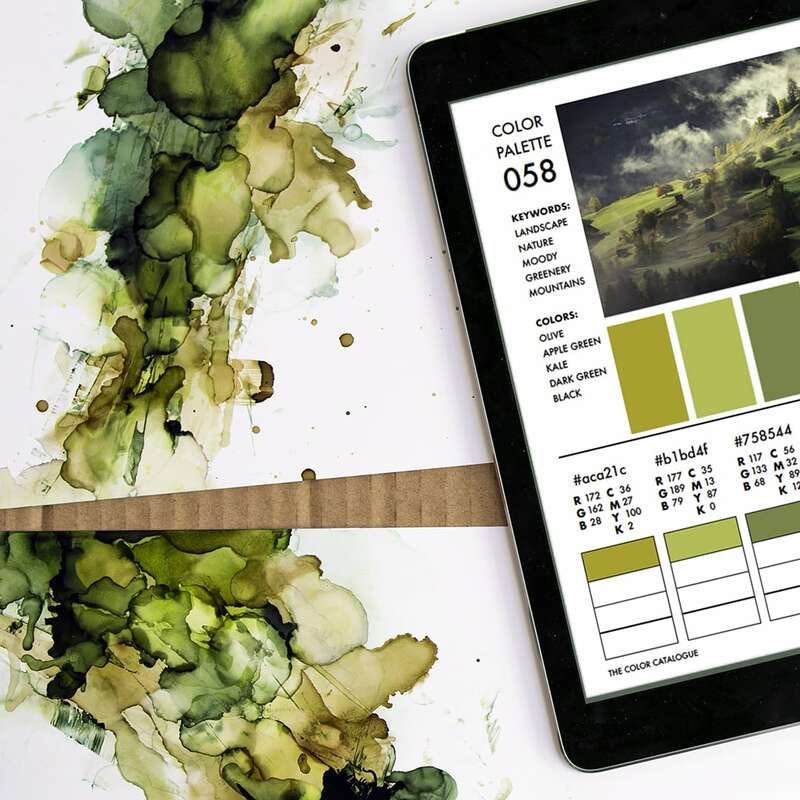 With the interactive menu, you can browse the palettes by color, by keyword and by collection. It really is what made me want to have this book and now I’m hooked. It’s so easy to find the colors you want to use according to the mood you’re in and it creates beautiful results. 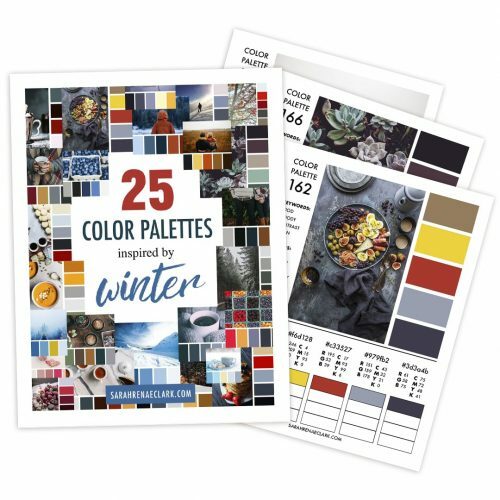 I never thought about color palettes before and since I use this catalog, I realise how some colors are meant to be together and my colorings are getting better. The most important thing is that it’s really fun to use and to have a new way to choose the colors. I’m happy with the layout and color swatching but I cannot activate any interaction on my pc to view different catagories. Is there anyway I could download it onto my iPad? This is an excellent resource for colourists. So glad I saw Claire Eadie’s YouTube video. Bought it straight away and am really looking forward to using it. Would highly recommend this. 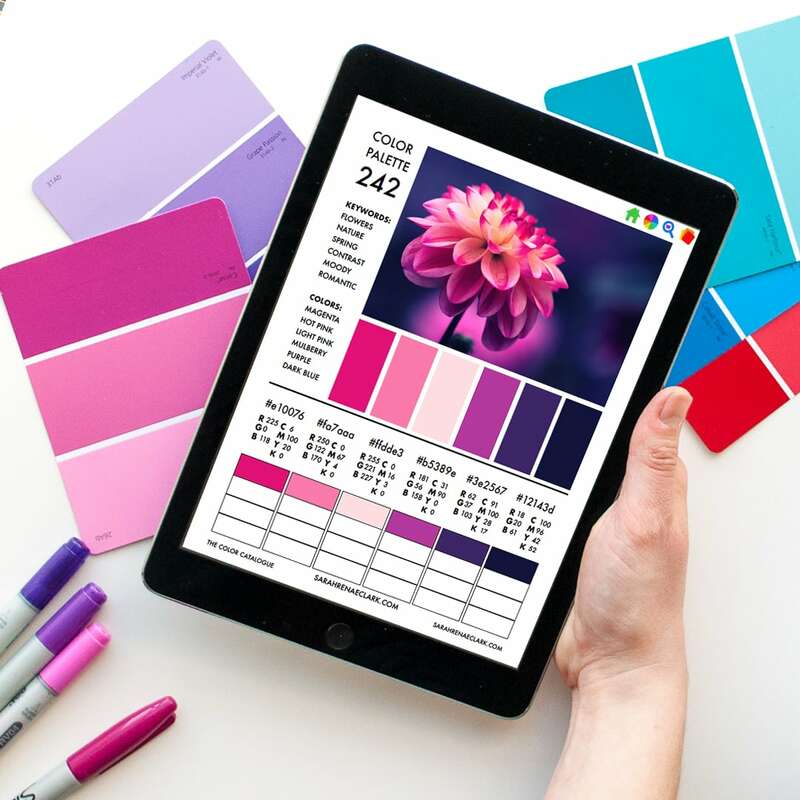 This is an extremely helpful tool for finding good color combinations for many different purposes, not only coloring, but also quilting, interior design or web pages. It’s interactive and really very easy to use. It will help me a lot. Fabulous, a real time saver. I have edited similar collections of images in pdf files and know how much work went in to this. Thank you for doing that work. For me, the biggest time in coloring is spent deciding WHICH shade/tone of WHAT color to use next. This collection will speed that up. I put my file on my iPad in iBooks and it works like a charm. Thank you! The Color Catalog is one of the best compilations of Color Charts I’ve come across and its uses go way beyond coloring. It is a good reference for painters, beaders and jewelry makers, fiber artists, paper crafters, mixed media artists and much much more. I was watching a YouTube video of an Acrylic Paint Pouring artist that I follow who found some of Sarah’s color charts on Pinterest and used one particular color combo for one of his acrylic pours. 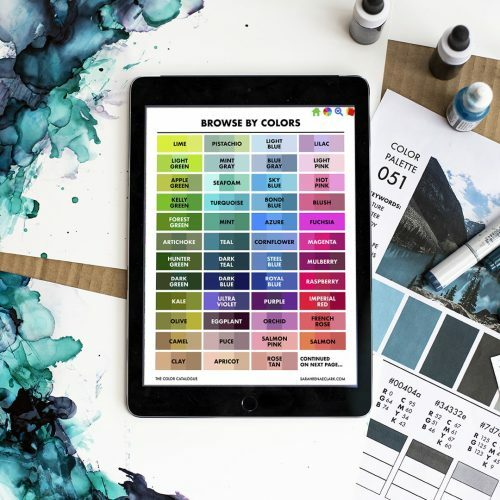 He was amazed at the results using the color combo and has inspired many of his paint pouring followers to search Pinterest for new color combos. Kudos to Sarah for creating such a beautiful reference! Absolutely love this colour catalogue!! A perfect tool for anyone in the art world!! Thank you! This is an amazing catalog. The amount of work Sarah must’ve put into this is mind-boggling. I just got it yesterday and I have already used it three times in projects I am doing. This is absolutely worth every penny. I am so happy to have a tool like this at my fingertips!!!! Fabulous. Thanks for the gift! I mistakenly thought it was an app, but it is still wonderful as is! Looking forward to using it soon. Thanks Sara , excellent as Im just retired and just starting in on coluring with no idea what colours go with what. Makes it so much easier to see what colors go with what. Just got it yesterday so only just started today. Look forward to using this as a valuable resource since I’m a new coloring aficionado. Hope you will be expanding the catalog in the future that will work within this catalog w/o having to purchase entire updated catalogues again. I just love it! What a valuable tool for my coloring. Very good resource. I know you can get similar individual colour guides on pinterest but that does rely on you having an internet connection when you want it, which isn’t always the case. The good thing about this pdf is that it’s interactive, once downloaded it can be used wherever and whenever you want, all the guides are in one place, and they are arranged in so many ways that really get you thinking outside the box. I do adult coloring, and this is very helpful and inspirational for choosing new and interesting color combinations. Sometimes, I get stuck in the habit of using the same colors over and over. This helps snap me out of it. Being able to interact with this catalog, and find color palettes by several different ways helps me figure out what effect I’m trying to produce. Good stuff. Really helps me on deciding what color palletes to choose .Love it! Been sick for 5 days so this was a good thing. Love it. love this. Will be very useful as I chose fabrics for my quilts as well colors for my card making and coloring. So glad to have found this. Such a fantastic idea, and easy to use, a great tool for the avid colorist that can never decide on a colour scheme! Checking out with my cart was a little clumsy dealing with the quantity but, I adjusted it after that smooth sailing. A very comprehensive reference guide for choosing colours. You can print it all out or just one page at a time, or save it on your device. I love the pictures with the colour palettes, I will be using this as my go to colour picker every time. Definitely a must have for a serious Colourist or Crafter. Really great, the structure of the book in pdf format is pretty neat. I like that you can search through different category and themes. very well done, lots of beautiful palette colors. Hope this will make it easier for me to find the colors I want for whatever painting I decide to do. Me gusta muchísimo, es muy interesante e instructivo. Great Tool for colouring. It saves so much time in choosing colour schemes for all types of situations. Very easy to use, I can’t believe how easy it is as I’m no computer expert. Love it. I am so impressed with this color guidebook! Super organized, clean, clear and informative. Must have taken a long time to assemble. I’m a new web designer and struggle with color themes so this will save me TONS of time! Thank you for putting this together!! This is great. Takes a lot of time out from trying to guess the Hex#. Easy to use. I used it for project on Canva. Love the colour schemes in this, I am a visual person and love the colours that pop, it will be great for those times when I am stuck for a colour combination. je suis très content d’avoir trouvé dans votre site ce que j’ai longuement cherché sur internet: les palettes de couleurs sont formidables et je vous souhaite beaucoup de courage et bonne continuation! Love it but it was kind of confusing trying to get it so I could just open it right away instead of opening it through the email. I have an iPad and an android phone but once my son figured it out it is great. Not sure how to do the interaction part yet. It has heaps of colour palettes that you can sort through in different ways. It is excellent. I plan to promote this wonderful resource in my paper arts classes! I’ve been looking at it all day and experimenting and I love it! This is a great collection of palettes and a fantastic design resource! Love the color catalog!! I can think of all kinds of uses for it. I was amazed at how this changed the way I choose colors. I’ve used the color catalog for several coloring postcards and they look completely different (and way better!) from anything I’ve colored before. I bought it for fun but it turned out to be really helpful and inspirational. The only thing I’m missing is a back button to return to previous page/screen, the lack of that option makes it a bit awkward to navigate. 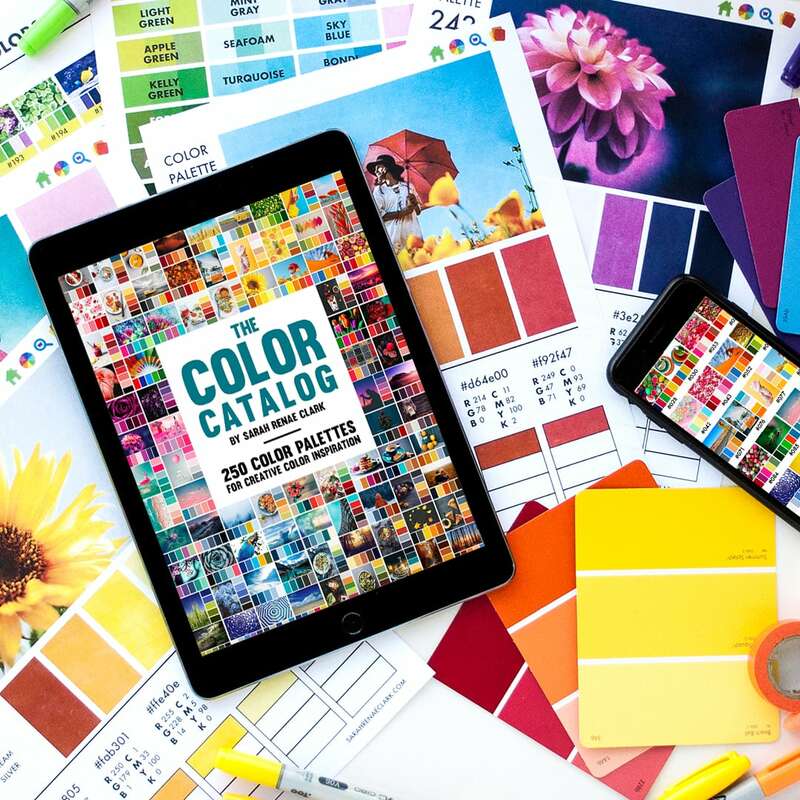 This creative and amazing catalog takes our world-wide Coloring Community to a new and wonderful level!!! I love it! I did not order, nor did I want a printable copy of your catalog. I was trying to order a paperback or hard copy. Your website is not user friendly, and I never printed nor did I receive a copy. Please contact me to correct this error. I am still interested in purchasing a clearly printed copy of your catalog with a precise representation of the color palettes, which cannot be acquired by making a printable copy even though I have a new HP Printer. 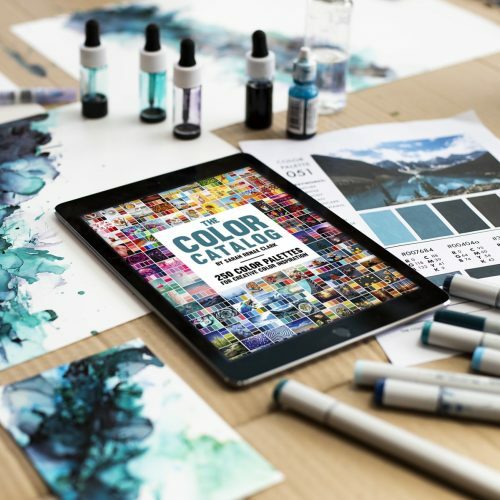 I was so surprised to find so much great information about coloring. I never have been good with color matching and it was so nice to find so much help all in one place. It was easy to order and I got so many freebies it was fun to view so many different designs to color. I would recommend this site to anyone struggling with Copic Marker and coloring. This will also help with my quilting and color matching what a wonderful tool. Fantastic color tool. Super sorting options. I work with fiber and paints. The pictures with the palettes are very useful to me. Did not realize that “purchase” was only for a downloaded version of catalog. Was very disappointed that actual color palette pages were NOT to be mailed separately. Not looking forward to having to print these pages myself every time I need one for reference! Thought actual pages were part of “purchase”. I’m going to enjoy working colour schemes out with this catalog, easy to navigate and use.so pleased I purchased. 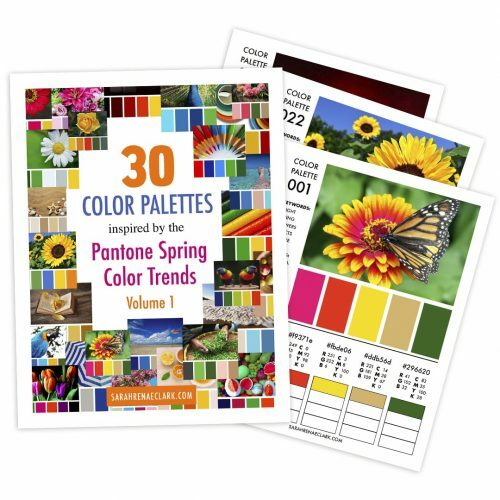 Excellent customer service, the Color Catalog is a great resource for all artists and crafters. Just received the Color Catalog so haven’t used it a great deal yet. However, it seems to cover every color combination you could ever imagine. Looking forward to using it with my acrylic pourings. Excellent Resource. 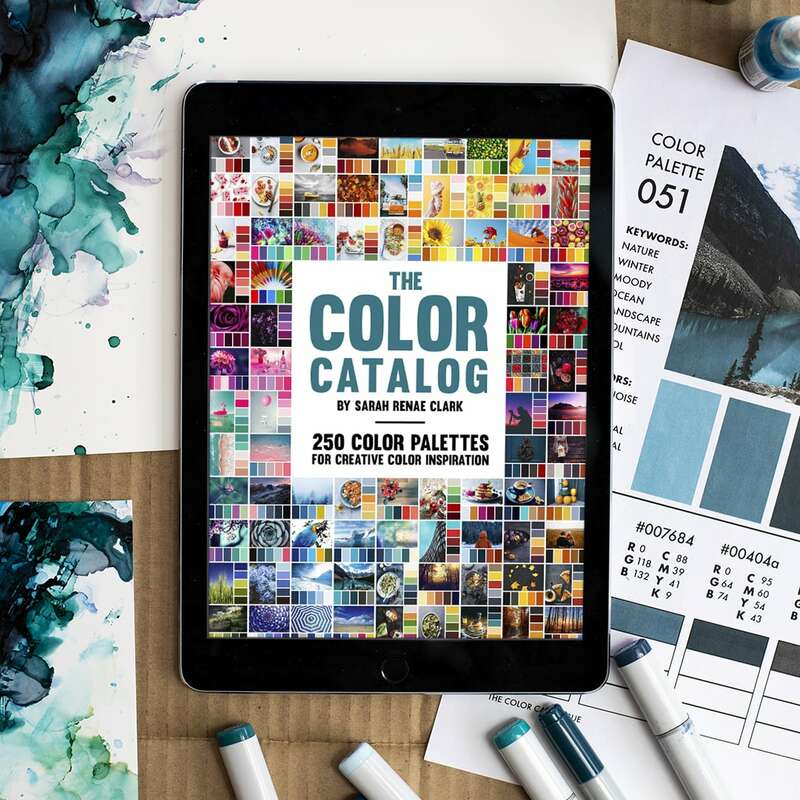 The catalog provides the color palette and the name of each color. It was delightfully ironic that I’d been looking at Youtube for some color combination suggestion (didn’t find anything helpful). Frustrated, I quit that and instead opened my Acrylic Pouring news letter and there it was, the very thing I’d been looking for all in your Color Catalog. It is SO beautifully, thoughtfully, professionally put together and the pdf is wonderfully user friendly for locating just what I’m interested in investigating! It’s a beautiful publication, Sarah. Congratulations on such a complete compendium. Jean M.
Love the color schemes!! Plan to use them with quilting projects, knitting & crochet projects in addition to coloring!! May even use ideas for re-doing my bedroom and living room! Will show them to my niece too as she is trying to come up with a color scheme for her wedding next year! I bought this primarily to choose colors for the interior of my new house, but I’m not sure that it is the best way to use the catalog. I can see how perfect it would be for coloring in though. I can’t express how much this book will help relieve the time and frustration of choosing color combinations for my pencil and paint art. Thank you so much for simplifying color combos without my spending hours on the internet.. A treasure this resource is! Beautiful collections, and so easy to access. I’ll be using this A LOT. Love the book so far! I started using it immediately and I know it will be a definite go to in my collection. Thanks for making such an awesome and necessary book Sarah. You rock! It’s given me all sorts of new ideas on color combinations and has added a new dimension to my art. So helpful. Love the easy usability and searchability of the color catalog. And the wide arrangement of color palettes will help me alot in the future when needing to decide on colors. Wonderfully helpful as I try to narrow down my own LLC branding, as well as tweak some client work where I couldn’t quite get the right shades. Love how easy it is to use with interactivity and single page prints! Terrific value as a time saver and for getting new inspiration. I discovered the Color Catalog through Pinterest, and what a find it was! As a self-taught graphic designer, this resource makes up for a huge gap in my experience. Thank you! I feel like a little kid at Christmas time… I’m so very excited to use your color catalog!! I am a colorist and learnt about the tool from a ‘Passion for Pencils’ you tube video. 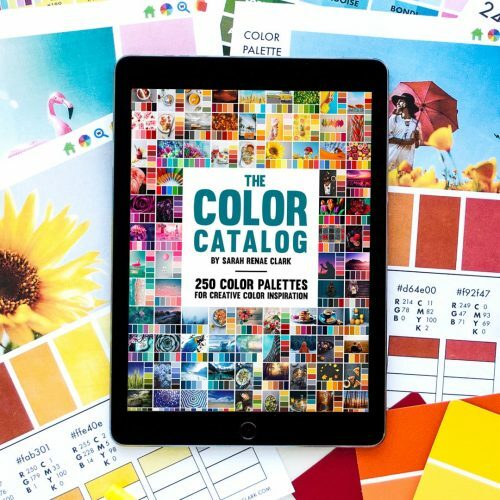 Color choice is the thing I find the most challenging so this ‘The Color Catalog’ is a great tool. This book is genius!!! Love it! What a tremendous help to those of us who cannot decide on a color palette! Thank you Sarah for your talent and for sharing this amazing tool. The Color Catalog is the best tool I have, besides my color pencils. It .makes color selection so much faster and better. The Color Catalog is very easy to use and search through the various options of holidays, seasons, landscapes, topics, etc. 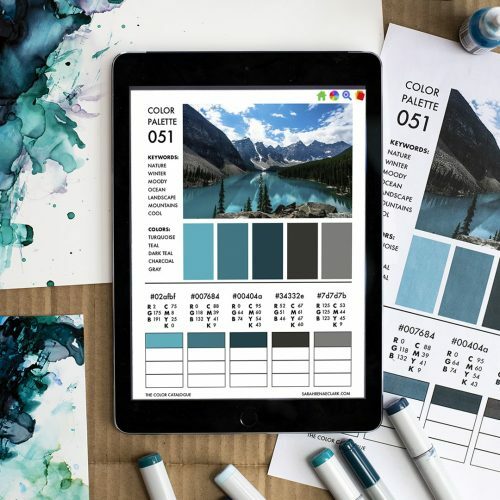 You can print out individual color palettes and resize each on your printer to what works best for you. Being able to swatch your own pencils to the color palettes makes such a difference. I never do any art work without The Color Catalog. need it is excellent and I would recommend this item. I’m very impressed after my scroll through the content. The information provided is very helpful and very substantial. I can hardly wait to use it. Thank you, Sarah! What an amazing Catalogue, well thought out & put together. I never imagined there could be so many combinations; it really staggers my imagination how I could have been without it. I found out about the Colour Catalogue by accident and am so happy I bought it. Thank you very much. I will like it more when I can open it on this iPad. Just using it for the first time for my next coloring project. And i love it. Helps me when i don’t know what colors i want to use. It’s an excellent to have on hand. Working on a hannah lynn image and used it last night. 🙂 So glad i got it. It is SUPER cool. I love it!! I love that all the colour charts are in one place. I plan on printing this off and putting it in a folder for quick reference. Well done, love it. Love The book. And the option to print of keep in my tablet and phone is the best. Will there be a 2nd edition? I had such a hard time picking colors to use in my coloring books, now I can decide on a mood or a main color and bam I’m off to the races. And on my way to picking out the pencils to use and doin what I love. Thank you for the time you spent, and effort u put in to this. It great for artists and other different things to color catalog. It helps… I love it! This is brilliant for doing my colouring. No longer struggle with which colours. I like the PDF, but the price is pretty steep. I would have given it a 5 if the price would have been $15. I have colored for 5 years now and I have never used a color palette before. When I saw this one I decided to give it a try and I am so glad that I did. It is absolutely amazing. What a wonderful tool to have. I can’t imagine how much time and work it took to assemble this catalog, but I am so thankful for all that work. I will be using the catalog on my phone, computer and tablet for a long time. Thank you so much Sarah. I love them! Palettes all in one place no seaching. I am very pleased with my order, both the quality of the Color Catalog and the value. It is well worth the money with all the time and effort it will save me in the future. I received the PDF immediately following my order placement. Thank you. Thankyou so much Sarah, for this amazing Catalogue. I first saw it on youtube Colourist review. Choosing colour combos heaps easier and much more fun for me now. I really appreciate the time & effort you’ve spent creating this resource. Sarah did an amazing job putting this together, I just completed my first picture using it and it is a wonderful tool to have. I will use it with all my pictures. This color catalog is both useful and fun, and Sarah was very helpful in getting me started. I highly recommend her and the product!